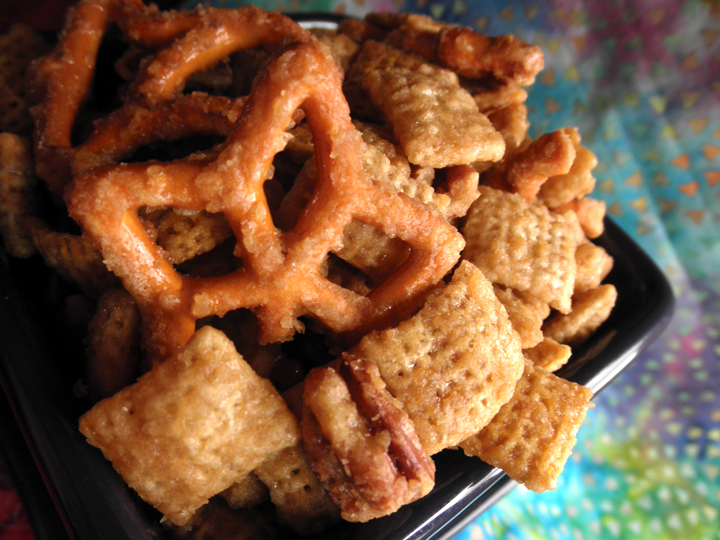 Brown sugar, butter, Chex...what more could you want? This stuff is even more delicious than caramel corn; plus, you don't have to worry about the popcorn hulls sticking between your teeth and gums. Eew. Although I think I've developed an immunity to the addictiveness of this sweet & salty treat, most people who try it can't get enough, and then they go home and make some themselves because it's a very easy recipe. I got this off of the Chex website, but since I printed this one out, they've changed it a little. Of course, I made a few changes too. I don't include M&Ms like they do, and I substitute some pretzels for some of the Chex, since I like sweet & salty things. I also added nuts because I'm an adult now, and I can take it. Any nuts work. I've used macadamia nuts which was a successful addition, but today I used pecans because they were what I had. Heat oven to 250°F. Spray a large roasting pan with no-stick cooking spray. (If you don't have a large roasting pan, you can use two cookie sheets or two 9 x 13 inch pans). Place cereal, pretzels, and nuts in prepared pan. Combine brown sugar, butter and syrup in 3-quart saucepan. Cook over medium-high heat until mixture comes to a boil (8 to 9 minutes). Continue cooking, stirring constantly, 1 minute. Remove from heat. Add baking soda; mix well. Pour syrup mixture over cereal; toss gently until well coated. Bake for 40 to 50 minutes, stirring every 15 minutes, or until coating is set. Cool and stir for 5-10 minutes, or until they don't stick together any more. Store in an airtight container. I make this every year and always add 1 tsp vanilla with the baking soda.